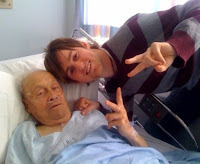 On April 1st, 2009 my Grandpa went home to be with his Lord. Though we miss him we mourn as people with hope in the resurrection of our bodies. My belief has been tested this week. Do I really believe that to be absent from the body is to be present with the Lord? As we watched the casket close, and my eyes glanced one last time at the man who has been as a father figure to me, I must say without the hope which comes by way of the cross and resurrection of Jesus, I could not get through this. I don't know how the unbeliever does this. I guess they surround themselves with fantasy as a buffer from reality and truth and say things like, "He's in a better place". I am so thankful for the Gospel which clarifies with crystal clarity that for those who know Jesus, for those whom Jesus knows, there is an everlasting rest in store from the moment we breath our last till forever comes. My grandpa was a humble, un-assuming, gracious, loving man. He was married to his bride for over 66 years. His integrity in business, his faithfulness in marriage, and his love for his family will be remembered forever. Memories of Grandpa for me are manifestations of God's grace calling me to live like he did; with integrity, faithfulness, and love all the days of my life. I had the privilege of giving the eulogy along with my brother. It was so comforting to know we didn't have to make up stories of grandpa, or paint a picture of him as something he wasn't. What a gift he gave us. The ability to be able to tell the truth about him at his own funeral. He was truly my hero and best friend. My prayer is that I will become half the man he was, and live my life in simple contentment, with love for my family, respect for all, and work hard all the days of my life for the joy of all those around me. Philippians 4:4-9 is a description of my Grandpa and was read aloud at his funeral. I encourage you to go now and take a moment and reflect on these words. As for Grandpa, he enjoys his reward, not that he attained it, but that it was given to him as a gift: The gift of an eternal resurrected mortal body created for pleasure, consumed in God's presence, never again tempted by evil, experiencing full health, and happy beyond measure. To this end we all live and die that we might join him and countless other Saints in the glories of heaven that even now our hearts and minds can not comprehend. To God be the glory, great things he has done for us! I read your words of love, compassion and your hearts cry. How I cry now for the man that I once called my Dad. I have the hope Jonathan, yet I miss him today. Thankyou for reminding me of the great gift that God gave me in having a wonderful earthly father, and Praise God that he gave you a wonderful earthly Grandpa. I appreciate all the beautiful things that you said. Yes, all true. May God bless us as we mourn the loss of such a wonderful man.